India is steadily stepping into a new lending regime. Digital lending represents a new era in mainstream lending and is fast emerging as a force to reckon with post a rather sluggish pace of lending for the country’s sprawling Micro Small and Medium (MSMEs) sector. Promising to be innovative, digital lending seeks to focus on the specific needs of entrepreneurs. NBFCs are rising to the occasion, mooting a variety of innovative loan products to handhold the sector, getting it ready to embark on a new chapter of growth and progress. The Unique lending platform promises to provide fast and flexible business loans to help MSMEs carve a new growth trajectory. For MSMEs, the lending process is always a stringent one and more often than not, difficult to follow / comprehend. TAB Capital Limited, a leading NBFC in the Digital Lending space, has created a simple lending process with the help of digital modules whereby a customer can easily apply for a loan & track his/her loan application process online. The entire process is seamless, paperless, digital and automated. TAB Capital seeks to provide disbursement to the customer within just 2 working days as part of its unique business blueprint. As Digital lending continues to grow, attracting entrepreneurs, institutions and professionals, the new lending mechanism is turning into a growing source for getting financial assistance in the shortest span of time. Any growing sector can attract service providers but digital lending will be one of the biggest innovations in the lending sphere, because of its easy, simplified and quick application process. 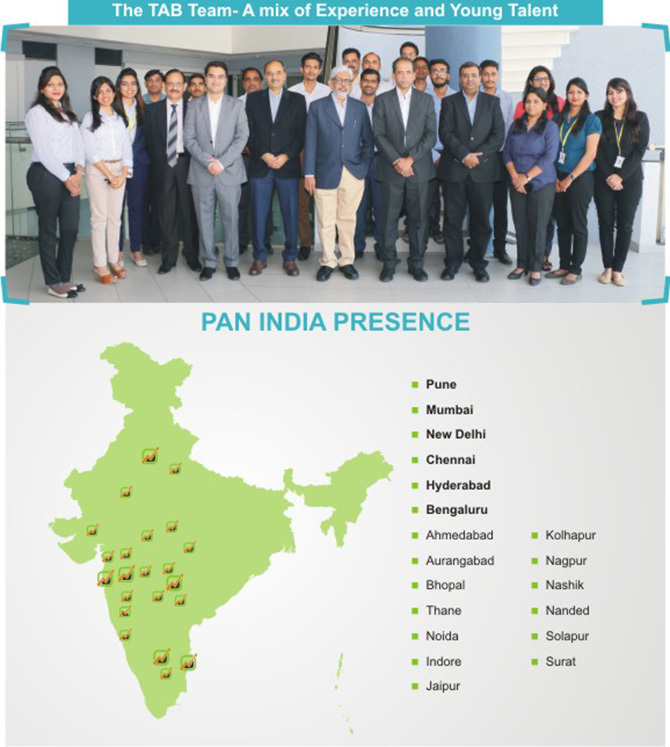 TAB Capital Ltd is providing a vital financing solution to the un-served markets of India. As digital lending is low on operational costs, TAB Capital Ltd. is able to provide cost effective loans to its customers. In this competitive world, it is the need of an hour to adapt with the changing consumer environment and turn "THE VIRTUAL AUDIENCE INTO REAL AUDIENCE". The new generation of consumers now expects things to be found and delivered immediately. As per the recent study conducted by Google –BCG, it was revealed that with the increase in smartphone users in India, 90% are likely to use digital payments for both online as well as offline transactions. Over 60% of digital payments value will be contributed by offline points of sale such as unorganized retail, eateries, transport etc. This change in consumer preferences has opened a new door for digital lending based NBFCs in the market. "We at TAB Capital believe in positioning the loan application and disbursement process at a whole new level by making your financing needs just a click away"- says Abhay Bhutada, Chairman and Managing Director, TAB Capital Limited. TAB Capital Ltd is a Public Limited Non-Deposit taking NBFC registered with the Reserve Bank of India which started its operations in March, 2016. Mr. Abhay Bhutada, a young, talented and passionate Chartered Accountant is the Promoter of TAB Capital Ltd. realising the difficulties of MSMEs in fundraising for their genuine business needs, Abhay decided to focus on this unserved segment by providing them funds with innovative loan products. Hard work, strong dedication, vision and right decisions at right time has made CA Abhay Bhutada a successful businessman. 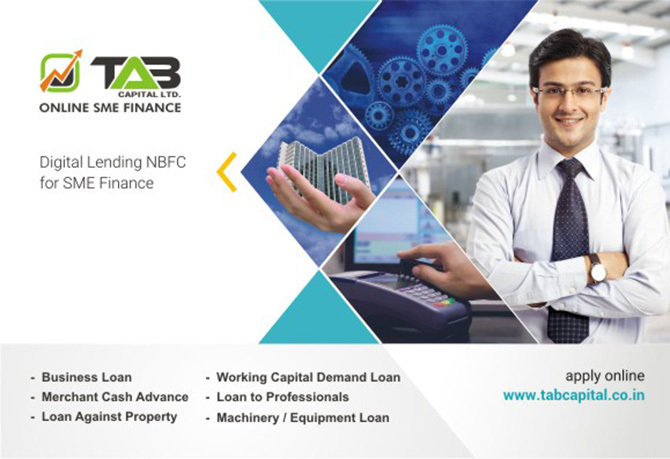 Due to the unique model and lower operational costs, TAB Capital is one of the first NBFCs which is profitable from the first year of operations itself. The business model of TAB Capital is unique and has been evolved after years of research & tapping into the experience of promoters/Directors of the Company. This unique model provides an edge to TAB Capital over its Competitors. The concept of the model is unique & thereby will be difficult to imitate. Unlike traditional lenders, TAB Capital is an Online Lending Platform that leverages technology to provide solutions to the financing needs of Professionals and the MSME Segment. Their centralized processing center provides greater efficiency to the consumers while providing better Risk Management to the Company as it entails direct involvement of Directors in credit based decision making. Digital lending is the new futuristic approach towards banking wherein the lending process is completely based upon digital modules spread across various channels of communication and devices. This process transforms the inefficient and lengthy loan processes into a completely digital solution which is paperless and hence fast and customer centric. This makes things more beneficial to the borrower and easy since it is automated and streamlined. TAB Capital has a team of dedicated, skilled and experienced professionals who are committed to serve the SME’s, professionals and entrepreneurs with regard to taking care of their financial needs. After thoroughly understanding client requirements, the products are tailored and personalized on the basis of the specifications provided by clients, which makes them exclusive to the particular client and their business. “Giving our clients what they want is our specialty when it comes to lending” says Mr. Abhay Bhutada Managing Director of TAB Capital Ltd.
Digital lending platforms believe that authenticity and accuracy of data are of extreme importance. Hence, in scenarios wherein MSMEs may not have audited financial statements, additional documents such as bank statements, invoices and tax returns are sought and used for analyzing the borrower's repayment capabilities. Due to the easy and fast online module, there is a huge inflow of loan applications from various parts of the country which helps in filtering out the very best applications. At TAB Capital we focus on certain basic and important factors which are imperative in providing the basic approval instead of getting into the hassles of lengthy paperwork. Unlike other lenders, TAB Capital does not focus on getting collateral securities from customers. TAB Capital have made the online lending process with efficient work ethics due to which the company has maintained record of zero NPA from the day of incorporation. For MSMEs, TAB Capital provides easy solutions. They can easily apply using our digital platform for the application process. Financial technology has been one sector which will be major game changer if our financial companies can adopt according to digital technology for finance. How digital lending can improve lending processes for MSMEs? ● Faster and Minimum Documentation: Fintech companies like TAB CAPITAL are adopting modern technologies to reduce the number of documents needed for loans. ● Disbursement within two working days: In order to ensure that SMEs don't miss out on valuable opportunities, TAB Capital Ltd seeks to disburse funding within two working days. ● Customized products for MSMEs: These are loan products which are suited to the needs of a diversified MSME sector. The company is currently providing loan products like Equipment / Machinery Loan, Merchant Cash Advance against POS Machine Transactions, Working Capital Finance and General Purpose Business Loans to serve various capital requirements in the MSME segment. The company is always on a hunt to design new products in order to cater to diversified needs. ● Unlike a traditional banks/lenders, who rely on collateral security & financial ratios, TAB Capital analyses the credit worthiness of a business by understanding the profile of the customer, cash flow, business model, social behavior and personal discussions with the Promoter. Loan size ranges between Rs. 2 Lakh to Rs. 1 crore, with the average loan size being around Rs.10 Lakh. TAB Capital intends to become a leading Digital Lending NBFC in the MSME segment. The company plans to achieve an AUM of Rs.1000 Crores in the next 5 – 7 years of operation. For the achievement of the said goal, the management is working on each and every factor which contributes towards the achievement of this goal. The various factors which the Company is working on include the creation of an extensive product line, strong Geographical and Digital presence and a strong capital Base. The company is looking forward to raise equity of Rs.100-150 Crores over a period of next 2-3 years. The equity infusion will be used for strengthening its data science capabilities & enhancing its technology platform.